I’ve come across bizarre stories over the course of my research and for those tales that won’t be in the book, I like to share them on this blog. This is one of those fascinating stories that I felt compelled to spend some extra time looking into so I could bring it to you. Charles Carson nearly became one of Folsom’s 93 and perhaps the title of the book would have been Folsom’s 94. Carson sat in Folsom’s back alley, or condemned row, for seven years; seven years of solitary confinement. He escaped the noose by never uttering a word. I should start at the beginning of his story though. From the age of nine, Carson was in and out of juvenile halls and eventually prisons. In the early 1900s, while sitting in a cell at San Quentin, he and a buddy formulated their next crime for after their release. Staying true to his word, Carson followed through with the planned, but unsuccessful, robbery. He earned himself a life sentence at Folsom prison. Not one to be idle, Carson and six others attempted to make a break for it from the quarry in 1904. Two guards and several of the conspiring escapees were wounded by gunfire. Carson and two others, J. Finley and F. Quijada, were all considered the ringleaders, and each received the death penalty in 1906. 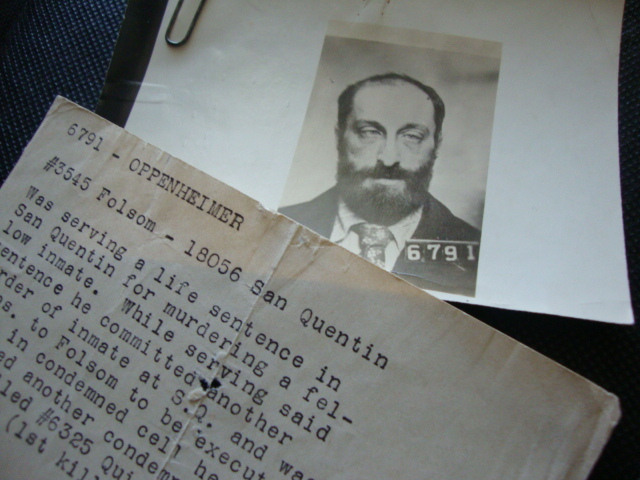 A bummer, thanks to Jacob Oppenheimer, Folsom’s 28th execution (but not until 1913). 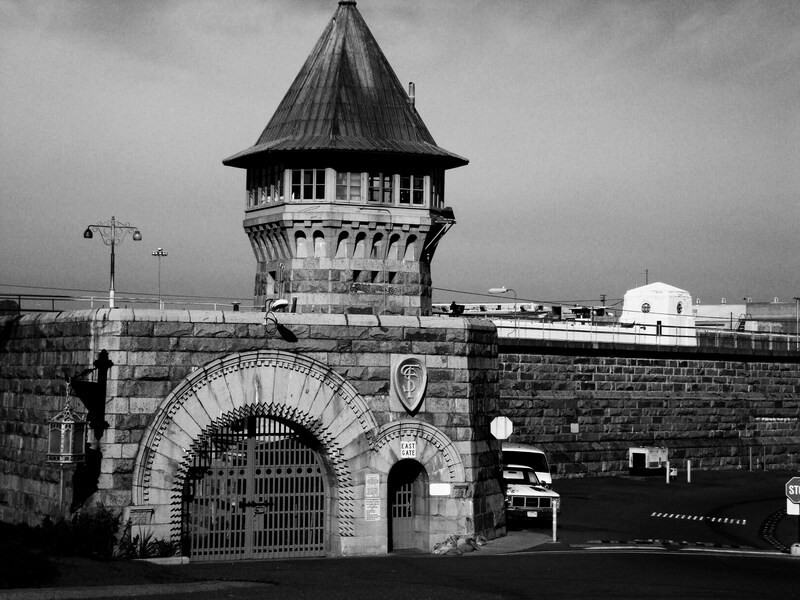 You see, Jake kept attacking and/or killing fellow inmates and guards, but since he was serving a life sentence, he merely ended up being transferred back and forth between Folsom and San Quentin. Prison authorities and law makers grew tired of Oppenheimer’s murderous ways, so they devised a plan. They passed a law in 1905, declaring that any inmate serving a life sentence who is found guilty of assaulting or murdering a fellow inmate or prison official, will automatically be given the death sentence. They figured it was only a matter of time before Jake attacked or killed again. So Carson’s pals kept him company—for a while. Finley was granted commutation to a life sentence and Quijada? Well . . . he happened to be rooming next to Oppenheimer and as presumed, Oppenheimer himself took care Quijada, a one-armed Indian in 1911. Back to Carson . . . By 1909, after pending appeals, he still sat in the shadows of the gallows. Then, in September, Carson suddenly and without apparent cause, lost his ability to speak. The warden and prison physician were rendered speechless themselves; Carson’s ailment baffled them. They requested state asylum doctors examine Carson. Amazingly, three years go by without determining a cause of Carson’s continued “mutism.” In 1912, The Oakland Tribune said Carson was, “Broken in mind and body as the result of six years constant brooding in solitary confinement in the death chamber at Folsom prison.” It earned Carson another reprieve. Physicians put Carson through many tests, one of which was the “ether test.” Doctors exposed the silent convict to the gas with the hope that while under “the intoxicating influence of the anesthetic he would lose voluntary control of his vocal organs and reply to questions put to him by the doctors.” Carson never made a sound. Despite this test, doctors declared at an insanity hearing, that Carson was sane, due mostly because the only signs of insanity were silence and blank staring. Back to his lonely cell he went. Warden James Johnston and prison doc, A. E. Ingersoll weren’t convinced Carson wasn’t nuts. So more tests were ordered. Doctors tried “loosening Carson’s tongue” with the help of hypnotist, Dr. G.R. Hubbell, who did his damnedest to put Carson into a hypnotic state. It didn’t work. Hubbell opined that Carson was a malinger since Hubbell’s other mentally ill patients always respond to hypnotism. “Electricity applied in a mild form” only produced a throat noise from Carson, but it still was the first sound from Carson in three years. Docs then tried the old water trick: tossing the patient from a hot water bath to a ice cold one. Again, no response. Apparently, doctors grew desperate and threw a bowl of scalding soup at Carson’s face. It didn’t elicit the desired effect. In fact, it didn’t elicit much of an effect at all from Carson. While riding the waves of yet another reprieve, Carson went up again in front of an insanity jury. Witnesses who testified against Carson at the original hearing, now changed their tune. They told the jury they felt Carson was certifiably insane. The panel decided that Carson finally earned himself a bed at the state asylum in Stockton. While there, Carson was caught smiling—the first observed display of emotion since 1909. Even though this remarkable gesture made the newspapers, it appeared to have little, to no effect on his mental patient status. Still under the sentence of death, Carson was given the ether test again—which he passed with flying colors. Carson spent the next couple of years being tested, and in 1915, Dr. F.W. Hatch, who earlier stated Carson feigned insanity, now declared the convict to be insane. Finally, in 1917, Governor Hiram Johnson commuted Charles “Silent” Carson’s death sentence to life imprisonment. 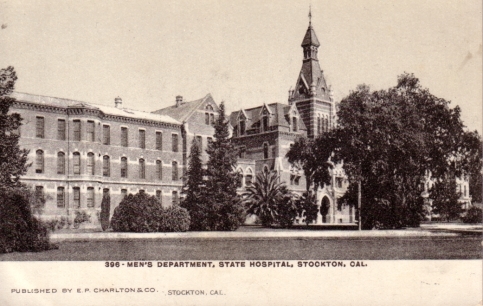 Carson would spend the rest of his life in the Stockton asylum. Johnson told the press, “I am convinced that at least substantial doubt exists as to the man’s mental condition and that after these many years humane consideration dictates a removal of the death penalty.” Much to the doctors’ surprise, even this news failed to induce a sound from Carson. The guy never uttered a “woo-hoo.” In fact, he maintained his silence for the rest of his life. In 1924, after 15 years of silence and 11 years in the asylum, 42-year-old Carson died from heart disease. Dr. Fred Clark, superintendent of the asylum told the press that Carson, a model patient, spent his time playing cards and reading the newspaper. Carson went 15 years without speaking. Whether it was self-induced or not, is impossible to determine, but he gained 15 more years of life. Perhaps in the end, Silent Carson had the last laugh. Categories: Folsom History | Tags: Charles Silent Carson, death penalty, Folsom prison history, insanity, Silent Carson, Stockton Asylum, Stockton State Hospital | Permalink. What an incredible story, April. I’d never thought about the men who might have escaped the noose through commutations or oddball stories such as this. Very interesting. Yes, there were many who came close, but were in some way, saved from the gallows. I can’t even begin to imagine the feeling one would have when their death sentence is commuted. There definitely could have been closer to a 100 or 105 at Folsom instead of 93, but some got lucky. Yes, what an incredible story indeed! I loved this. It is so refreshing to find a blog like yours. Whatever may have happened to Carson to make him mute, I guess we will never truly know. In the end, I do suppose he had the last laugh (internally of course! lol) Great article! Thanks, J’aime. Isn’t his story bizarre?! And I’m sure there are hundreds more like his.